Last summer, I saw a digital ghost. I was walking around the Ring of Brodgar – a neolithic stone circle in Orkney – in the early hours, at the first light of dawn. 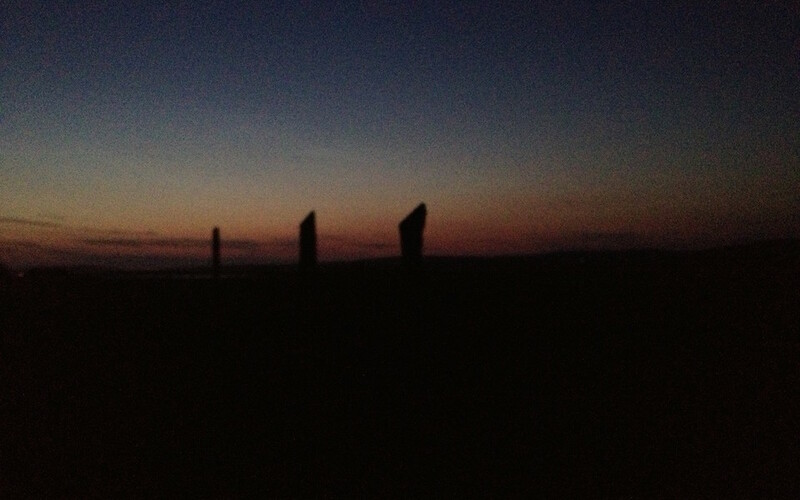 I raised my phone to take a photograph of the standing stones silhouetted against the sunrise and saw, on the camera screen, a dark figure moving across the heather at the centre of the circle. But when I lowered my phone, the figure was not there. It seemed to have only existed digitally, within my internet-enabled device. The German term “wanderjahr” (journeyman year) refers to the tradition of setting out to travel after completing an apprenticeship as a craftsman. A year ago, my first book written but not yet published, I embarked on a period as a digital nomad. My plan was to move around, to live in different places. My job as a freelance writer enables me to work for remote employers, using communication technology and not be tied to any workplace. Since then, I’ve lived in a London tower block, a Greek island bookshop and various Berlin tenements. I’ve moved often for years. My Amazon account shows more than 20 addresses – homes and workplaces – where I have had parcels delivered in the last decade. Yet I have kept the same email address. So in many ways, the internet is my most stable home. For a month, I am sleeping in a stranger’s bed, surrounded by her books and pictures, using her cooking oil and Wi-Fi. When I go, I clean the flat and buy new toilet paper. I do not leave a trace. This is the sublet life. Every month we shuffle. There are layers of subletting, renting from someone who’s renting from someone else, with varying levels of formality, and so on. Renters keep moving somewhere new, but leave open the option of returning. The idea, the dream, is that the digital nomad can sell their possessions (or put them into storage facilities or friends’ attics, to be reclaimed for the endlessly delayed settling down) and move freely with the seasons. Books and music and photographs are stored digitally. Unencumbered by a mortgage or children, I exploit cheap air travel and the freedom to move and work within the EU. Here in Berlin, there are 40,000 English-speaking expats. Americans and Canadians are able to live in Germany on freelance or artist visas. It’s the capital city, but not the financial centre (that’s Frankfurt) and so lacks the city workers that push up property prices in London and Paris. The empty buildings and cheap rents that make Berlin appealing to me were created, in part, by its brutal history of dereliction and division. The reality behind the fantasy digital nomad lifestyle – the laptop on the beach, the total integration of work and leisure – is often more complicated. It’s more practical: to rent a flat in Berlin costs about a third of what it does in London and pounds paid by UK employers will go further here. It’s less glamorous: I’ve been poor and had to get a job packing tea into gift boxes in a warehouse with other artists, which saw me through the winter. I’ve met international visitors in this city who can’t afford to go home; people who realise they’ll never be able to afford to buy a house so decide to keep on moving; people never able to find stable work. I’ve stayed on friends’ sofas between sublets and I’ve faced the bureaucratic problems that come from having no fixed address. I’m writing this in one browser tab: the others are open with email, Facebook, Twitter, articles I’ve started reading and a video I’ve quarter-watched. I open another tab for BBC News. The borders of Europe – at Calais and the northern coasts of the Mediterranean – are straining with refugees trying to enter the countries I freely move between. And it’s suddenly clear what a privilege I have, the luck of the passport I hold allowing a lifestyle many risk their lives for. I click back onto Facebook. People are talking about electing a new Labour Party leader; the Northern Lights were seen in the skies over Orkney last night. I look at photos of a baby of someone I was in a pub quiz team with seven years ago; the new profile picture of someone who came to view a room in my flat in 2010; the new girlfriend of someone I went on an internet date with; inspirational quotes posted by people I worked with five jobs ago. Social media keeps my links with past lives and locations open. It is brilliant and confusing. I feel omniscient and thinly spread, my mind technologically-enhanced yet fractured. I don’t know whether to spend my time connecting with old friends online or meeting new people in my new city. This sublet or freelance culture is growing: people keep all options open, skimming the surfaces of other countries and different cultures, digitally fractured, never committing. There’s an alternative society on Craigslist and Airbnb; on cheap flights websites and Tripadvisor; at the gym and the swimming pool in the daytime; in coffee shops on laptops – people working from wherever, or not working at all. They move between the cool districts of international cities – London, Reykjavík, Melbourne, Berlin – the currency and timezone change, but they are the same. The only language learned is how to ask for coffee and the Wi-Fi password. We talk about our computing equipment and behaviour online as our parents talk about their cars. It is how we get places. All I want is Wi-Fi and a lockable door. The internet insulates me from the foreignness of a new place. I can glide around the city guided by Google Maps, streaming BBC Radio 4, posting pictures to Instagram, looking up phrases. Germany barely touches me. But when my phone runs out of battery, I am lost, unable to read the language or locate myself. You can travel the world with headphones in, scrolling Twitter. Everywhere in Instagram squares, everywhere in Facebook feeds. Everywhere is the same, everywhere is me on my laptop, sitting up in bed, screenlight pouring into my pupils and keeping me awake. Queueing in the supermarket, in smoking areas and AA meetings and airports in different countries; I am looking at my phone. I could be anywhere. I’ve found, lately, that when people message me to suggest meeting up, or in a potentially-romantic situation, they drop personal articles – it’s all “Be in touch?” or “Wanna meet up?” rather than Would you like to meet up with me?” – never implicating themselves, or making firm plans, always suggesting they have somewhere else or somewhere better they could be. I’m walking to meet a friend in Berlin and Beyoncé is buffering on my phone, snatches of the song – “We woke up in the kitchen…” – entering my ears through my headphones, between the dealers around Görlitzer Park offering me drugs. The digital and the street intertwine and I’m quite happy with that. I drove from Orkney to London and went to bed dreaming of Satnav. I fell asleep outdoors in an east German forest in dappled sunlight and dreamed about the internet. I’ve been reading Rebecca Solnit’s A Field Guide to Getting Lost. She says: “Nomads, contrary to current popular imagination, have fixed circuits and stable relationships to place; they are far from being the drifters and dharma bums that the word nomad often connotates nowadays.” I send videos of old songs to my brother and friends. I use Citymapper to navigate to swim in lakes I’ve found while flying high above the city on Google Maps’ satellite pictures. I find out about my new home on Wikipedia. I transfer money and plan new journeys. I use my phone to take photographs and make sound recordings and illuminated notes which I send instantly around the world via undersea cables and pulses of light. This sensation of things being “switched about ever anew” and “manifoldly interlocking paths” strikes a bell in my digital heart. Within 24 hours, on the day I left the UK, two of my best friends announced via email that they were getting married. In between the two emails, I had taken a flight moving to a new country. On the other side of the world, in Joshua Tree, California, my friend got married today – a wedding too far away for me to attend – but I’m still connected to my old friends, following different networks to others part of the globe. I discovered that Google Maps had been tracking me and I liked it. My location history is a digital diary and I don’t want to disable my trail. On the maps, there are red dots on places I had been, or more accurately where my phone had been, all over London and Berlin. I got confused. I felt I could copy and paste things within my body. Although I’m enthralled by these digital wonders, I must remember to not conflate the individual with the device. My social media profiles are not me. Although I’ve been away for more than a year, I keep thinking about where I’m from. Once a month, I receive the Orkney Bird Report email, a list of all the unusual species seen on the islands that month, and my heart aches. “Home is an outdated concept,” my Berlin friend – an Australian with English and Indian parents – said. But my friend Kate said that any artist worth their salt needs to spend some time living in a different place so that they know where home is. Despite resistance and flight, some sort of “home” is holding on to me. I don’t want to leave my options open for so long that ghosts blow in. So I have decided to conclude my wanderjahr. With my last paycheck from my summer job and a one-way Easyjet ticket, I’ll go back to Orkney. I want to walk around the stone circle again. I think about my digital ghost, existing only in pixels, condemned to always be online. Was it a glitch or a trick of the light? There is a history of using technology to contact the spirit world. The standing stones, and the methods used to transport and erect them, were the most developed form of technology available to the Neolithic people of Orkney. For 5,000 years, this site has been an important place at the heart of the island and we’d be misguided to think it no longer works. We digital nomads are insubstantial, flitting, often pale and nocturnal, living more online than in the world. It strikes me that my phone is a reflective surface. Maybe that digital ghost is me. Amy Liptrot is the author of The Outrun, published January 2016 by Canongate Books.